so you want to make a quick dinner, and don't know what to fix? that's what i was faced with tonight, so i went to the fridge, and took a look inside. hmmmm, veggies, frozen boneless chicken breasts.... hmmmm... i know! STIR-FRY! first of all, you don't need a wok, since a good skillet or saute pan will do the job. but if you do have a wok, there are some tricks you can use while cooking that are almost impossible with a flat bottom pan. so... let's start with a wok mine's a hammered cast iron wok i bought at a flea market in hawaii for about $5.00 twenty years ago. next: prep your grub for cooking. i usually use whatever is in the fridge, but zucchini, carrots, celery, peppers, cauliflower, broccoli, bok-choy cabbage, bean sprouts, onions, garlic, and snow peas are all great in a stir fry. 1 onion chopped. 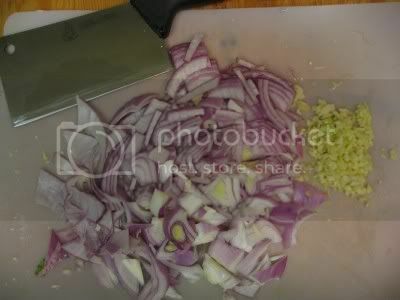 i used a red tonight, but if i had a white onion, i would have used it instead. stronger flavor. 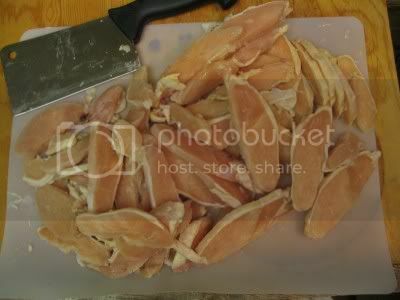 4 boneless chicken breasts, sliced (see picture). these bad boys were frozen solid out of the freezer, so i let them sit for about 10 minutes while prepping the veggies. mostly frozen chicken slices easier. prep veggies once you have the veggies prepped, put them in a microwave safe bowl, add about 1/2 cup of water, cover with plastic film, and nuke for 5 minutes. when done, leave the wrap on until you are ready to toss into the wok. this gives the veggies a head start. if i'm doing the whole production for guests, i'll get the steamer out, but since i was looking at making a quick dinner, the wave works just fine. 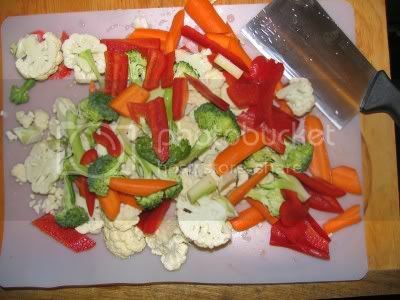 then prep your chicken you want the slices thick enough so you can cut them easily, but thin enough that they will cook rapidly. put a tbs or so oil in a heated wok, and toss in the chicken. since i was using frozen chicken, i got a LOT of liquid out as it cooked. considering the package says up to 8% by weight of "broth" to keep it moist...yeah, you are paying chicken prices for water, you can expect this to happen. i really like using fresh chicken, but then, this was a quickie, not planned ahead. 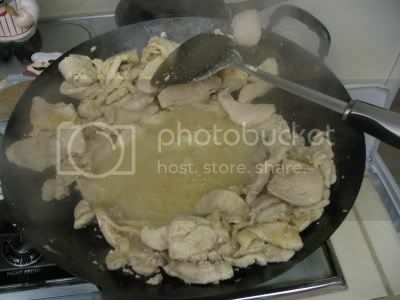 so as it cooks, push the meat up the sides of the wok to allow the liquid to boil off. i usually toss in a couple of pinches of garlic and a few shots of whatever flavor sauce i'm using. it gives the meat a chance to absorb some of those flavors while cooking. continue to cook and reduce the liquid until the meat just starts to brown. you don't want it "fried" crispy here, just cooked through with a little color. most of the flavors will come from the spices. when you think the meat is done, toss it into the serving bowl. the bottom of the wok will have all kinds of crunchy bits stuck to it at this point. don't worry about it, because you want that for some of the flavors you will get out of it later. here are the veggies ready for the wok, and the spices i used tonight. 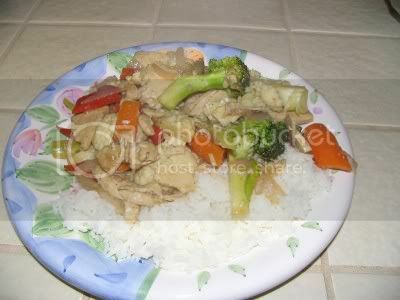 or any variety of oyster sauce, vietnamese fish sauce, or just plain old "stir fry" sauce available at any supermarket. yoshida's is the best, but tonight i felt like oyster sauce. be stingy with the sauce, and taste as you go. too much can ruin the dish for most people. me...i like it, lots of it, but i'm in the minority when it comes to oyster sauce. another good sauce is hoysin sauce, or even plum sauce, both available in the ethnic aisles in the grocery store. don't be a slave to preconceived notions regarding flavor. experiment a little. what i used tonight is what was in the fridge. if i was planning this out i might have bought a purpose made sauce at the store. even teryaki sauce is good! if you are a "roll your own" type, and insist on doing everything from scratch, the marinades i posted here and here both make great stir fry sauces. but i would like to point out that even the chef's typically use prepped sauces. just thought you should know. on with the show. a glug of oil, heated, gets you ready for the aromatics. add the onion first, cook for about a minute, toss in the garlic, stir fry for as long as it takes to just start browning the garlic. too much, and it's bitter. not long enough, and you won't develop all of the flavor. when done, toss in the bowl on top of the chicken. now the wok should be getting a pretty good layer of brown stuff cooked onto it. a glug of oil, swirled around the wok, needs to get HOT but not smoking before adding the veggies. i like to use peanut oil. DO NOT UNDER ANY CIRCUMSTANCE use olive oil for this process. 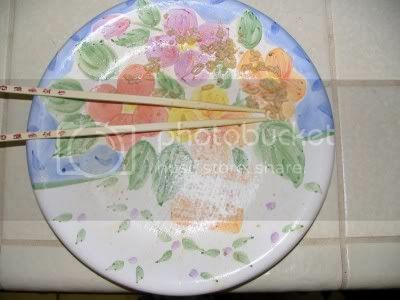 it breaks down long before it ever gets hot enough to cook with in the wok, making your food taste NASTY. 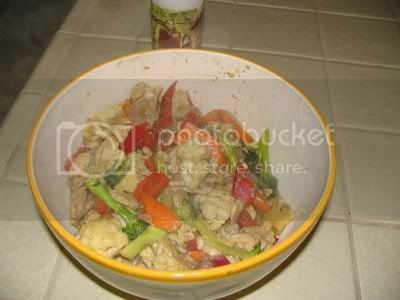 toss in the veggies, and stir fry for about 2 minutes, turning often enough to keep anything from burning. 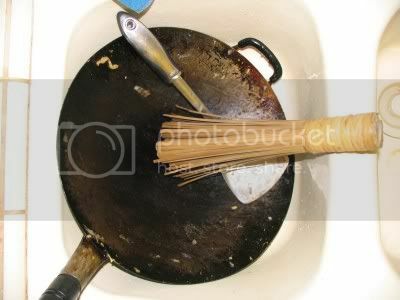 then add about 1/2 cup of water, and use your cooking utensil ( i use a "chan", or wok spoon, because it is curved to match the wok's shape) to get all those good brown bits up into the mix. 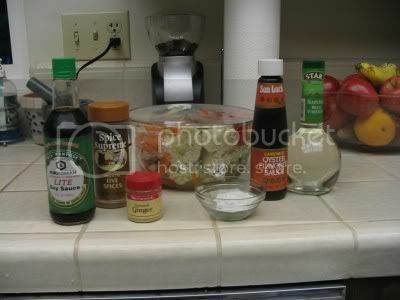 add a glug of rice vinegar (this can be omitted), the ginger, 5 spice, and your flavor sauce. taste, adjust as necessary. continue to stir fry until the veggies are close to the texture you like. i like them pretty al dente, so i don't go too long in this step. when i'm happy with the veggies, i dump the bowl contents of chicken and aromatics back into the wok, and toss, getting everything nice and hot. next, i mix about a tbs of corn starch in a 1/4 cup of cold water, and slowly add while stirring. if i add vinegar, i usually add a tsp or so of sugar while making the sauce, to balance the flavors. this makes that great sauce that soaks into the rice....mmmmmm. if it's too thick, add water and stir as necessary to thin it out. you are not looking for a gelled clump here, just a slightly thicken sauce. a gravy if you will. i've written before about how i clean my cast iron without soap or abrasive pads, and here is the secret: a cheapo cheapo available in asian grocery stores (or china town in san francisco, but then, that's fodder for another post). it's just a bunch of bamboo pieces made into what is basically a very stiff brush. this thing works like magic on the wok, and on my cast iron skillet. remember to dry the pan with a paper towel, and put on a low burner to insure all of the water has evaporated. then glug a little oil into the pan, and wipe it around the entire inner surfaces. let it cool, and it's ready for the next adventure. I'm going to sneak in and steal it some night. it was one of the best $5.00 investments i've ever made. i can't even begin to guess how many meals i've cooked in it. besides stir fry, i use it for making tempura shrimp, and just about any sauted veggies i cook, as well as things like pot stickers. it's a great pan. i've seen one similar to mine on sale in quite a few cooking places, and they run about 25 or 30 dollars. it comes with all kinds of stuff that you just end up throwing away. like the lid. i have never used it. it's just a space waster. a simple steamer basket is much more efficient and easier to use than trying to steam in a wok for most of the foods you or i would be making. i just don't see most people needing a big bamboo steamer basket to steam a fish, or make char sui pork buns. there are other tools that work better, and easier, and take up a whole lot less space. for a wok, there are just a couple of utensiles needed. first is a good wok spoon, or chan. two of them is better. they are shaped to fit the curvature of the pan. a good bamboo cleaning brush is the other necessity. and a spider, or wire spoon, is indespensible when using the wok to deep fry stuff, like shrimp. the secret is never use soap, and never use an abrasive. just like cast iron pans. and cook on it enough to figure out a couple of tricks to get everything done properly. there were some real stinkers in the beginning, but now i don't even have to think about what i'm going to do, because it's almost automatic. 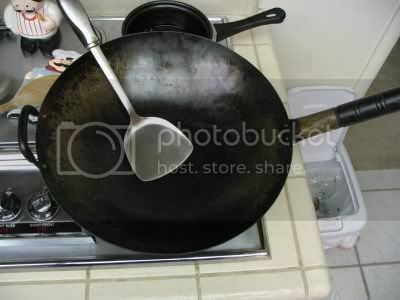 searching for woks with a google image search i found your wok pictured with the caption, hammered cast iron. I thought it was funny so i decided to add a comment.